Paranormal romance novels for young adults; now let me start off by saying this blog post is going to take the form of a monologue/rant but it will not just consist of me attacking this genre of books. I actually like this genre of books personally and I have kept up with a few series such as the House of Night Series by P.C. Cast and Kristen Cast. I also read the first Vampire Diaries book by L.J. Smith. 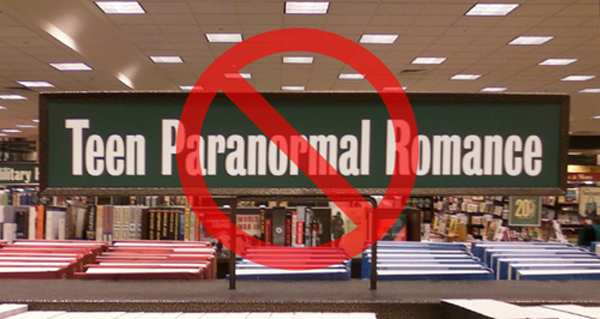 The problem I have is with the emergence and explosion of the Teen Paranormal Romance sections within bookstores. I feel that the whole craze started with the Harry Potter series. Now I understand that Harry Potter isn't necessarily a romance novel but it is definitely a teen paranormal novel. Some of you may be thinking that Harry Potter isn't actually a paranormal novel but lets look at the actual definition of paranormal. According to dictionary.com, paranormal is defined as: of or pertaining to the claimed occurrence of an event or perception without scientific explanation, as psychokinesis, extrasensory perception, or other purportedly supernatural phenomena. Now as far as I know, nobody has been able to explain the magic in Harry Potter through science. Of course now, Twilight is the series that brought the paranormal romance novels for young adults into the spotlight. Since Twilight was made into a movie, there have been more and more of these type of novels that are being turned into TV shows such as the Vampire Diaries or Secret Circle. I have no problem with the explosion of these type of novels, movies, or TV shows; I mean how can I blame people for wanting to get into this niche market with all of the money that Harry Potter and Twilight have made. The problem I have is that the explosion of these types of book in bookstores has started to take over my favorite section of books. I am upset that the paranormal romance novels for young adults section of books has completely separated itself from the section for teen books and has developed into its own section. I am really upset because the emerging section has taken some of the space from the Science Fiction/Horror section. The Science/Horror sections of the bookstores have now been extremely condensed. I feel like the Science/Horror section is not as getting as much attention as it deserves now. Instead of the Science/Horror section taking a hit, I feel that the teen section should have to compensate for the emergence of the paranormal romance novels for young adults section or I feel like the bookstores should set aside a whole display in the front of the store for that section. The emergence of this section is also coming on the heels as something else that is bugging me which is the fazing out of bookstores but I will leave that for another time.